The E.S.E Lightning Protection System can be a much more cost effective solution then other types of lightning protection. This is because more than one building can be protected with a single unit. Another advantage is that E.S.E. Lightning Protection Systems Protect everything within a 150 foot radius zone of protection. This means that children, pets, and live stock or other valuables can be protected from lightning even if they are located in the yard of a protected structure. The Lightning Conductors, Air Terminals and fittings we utilize are also UL Listed and certified. WB Lightning Rods is a Premier Lightning Protection Design and Installation Company for The E.S.E. Lightning Preventor. With Locations in Delaware and Florida We Cover the all of the east coast and Midwest regions of the USA. This System is known as an Early Streamer Emissions Lightning Protection System and is manufactured by Lightning Preventor of America, a division of Heary Brothers Lightning Protection Co. Heary Brothers are a top manufacturer for Lightning Protection Systems Since 1885. We are one of their preferred contractors. WB Lightning Rods E.S.E. 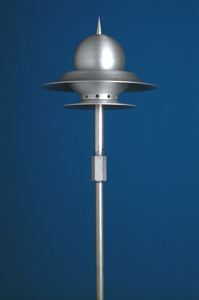 PREVENTORS are dynamic in operation, Whenever a storm cloud approaches a building with lightning Preventors or other lightning protection systems (such as lightning rods) the electric ion field increases between the cloud and ground. Those ions will constantly flow from the Lightning Protection System carrying some of the ground ion charges towards the storm cloud. The ESE Lightning Preventor System will reduce the charge for the time while the storm clouds are passing by which prevents lightning from striking. The Lightning Preventor is a Complete Lightning Protection System witch will reduce these tensions and prevent the discharge of Lightning. During very intense storms, the charge maybe too strong to completely prevent the lightning from striking. When this happens, the E.S.E. Lightning Preventor System will emit an ion stream (hence the name “Early Streamer”) into the atmosphere which balances the electrical potential between the protected building and the cloud without allowing a full fledged lightning bolt to form.